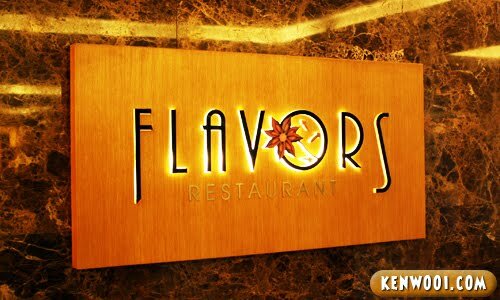 Flavors Restaurant is also another place where I had Chinese New Year dinner recently. Located at the heart of KL, it’s certainly one of a kind. 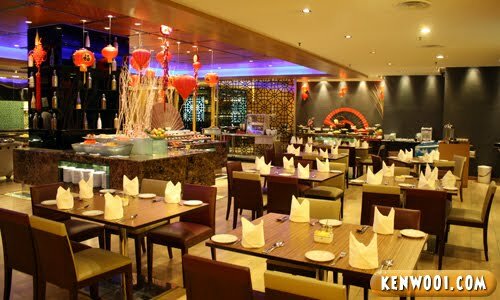 Despite setting in a traditionally inspired atmosphere, the restaurant is well-decorated with Chinese New Year ornamentation – a sign to welcome the festive season. All thanks to their invitation, I got the opportunity to attend the launch of their Chinese New Year “Year of the Rabbit” dinner buffet. 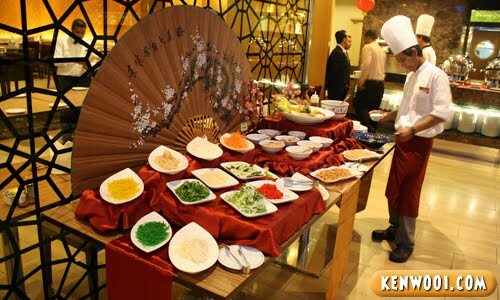 Once you step into the restaurant, you’ll be greeted by a grand table of Yee Sang ingredients. Oh yeah, my first Yee Sang was at Shanghai Restaurant. So this was my second Yee Sang of 2011. 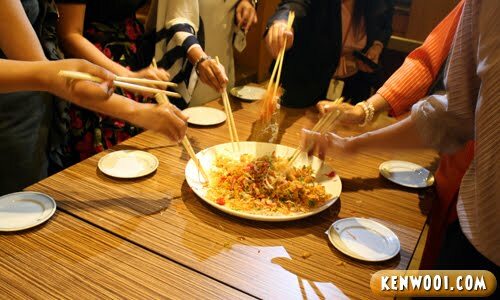 If you’re wondering why are there 3 plates of Yee Sang, it’s because there were many invited guests that night. And as usual, the tossing and mixing of the Yee Sang ensued. The higher you toss, the more luck you’ll get for the new year! 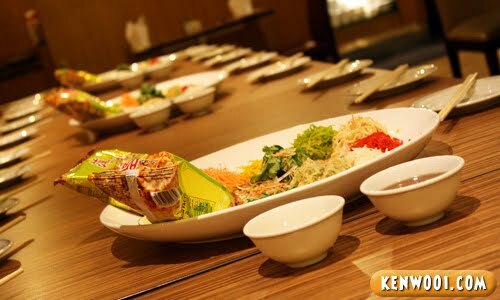 The Yee Sang’s prices are up to RM48+ for half portion and up to RM78+ for full portion. And with that done, it was time to help ourselves with the buffet spread. 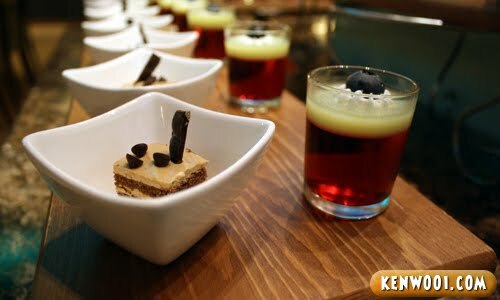 The food showcase is certainly presentable and neat. 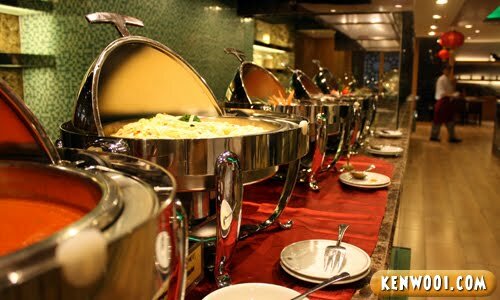 Categorization of the food also eases the food selection process. 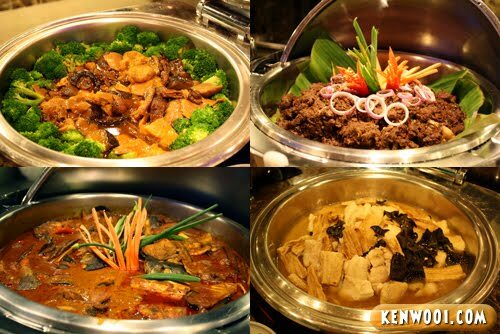 Clockwise from top left: Braised dry seafood with oyster sauce, Rendang daging, Steamed fish with black fungus and Salmon head curry. 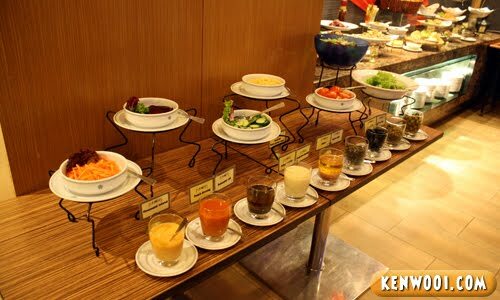 Other than that, if you fancy salad, there’s a salad bar with various dressings and sauces. And if you like ice kacang, there’s a counter just for that! 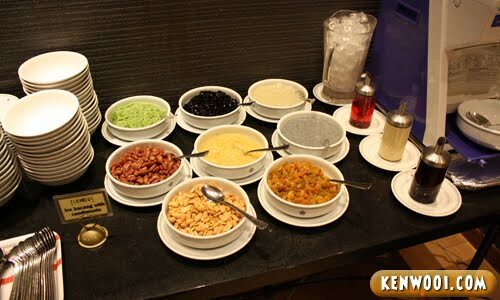 Prepared with a range of condiments, you can create your own ice kacang recipe! 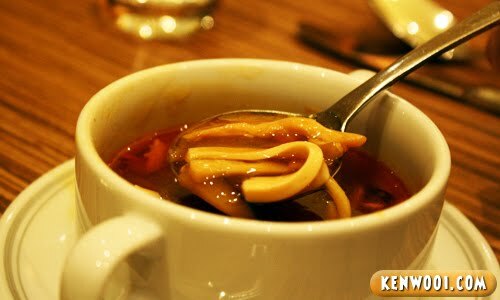 As for the soup, I took the hot and sour Sze Chuan soup. 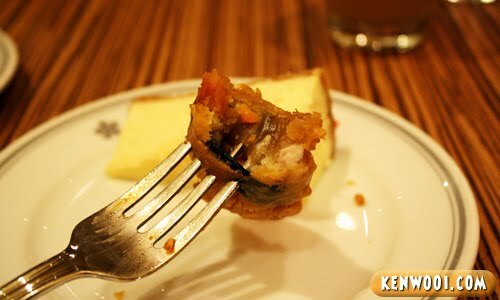 The taste was not too sour, not too spicy – just nice. 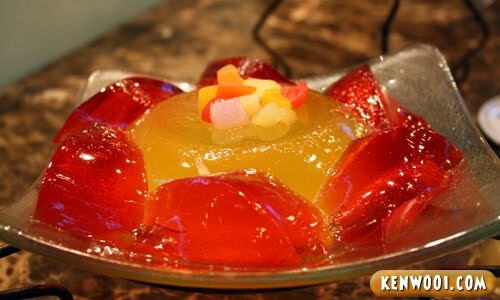 And at the dessert section, there are a variation of small pieces of cakes and cups of jellies. 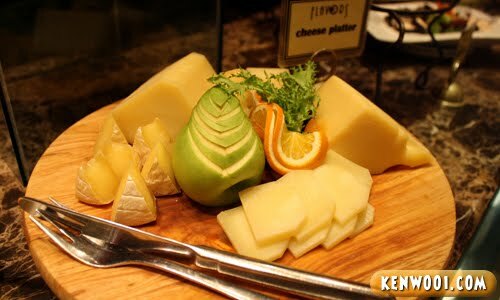 Then, my favourite – cheese cake! 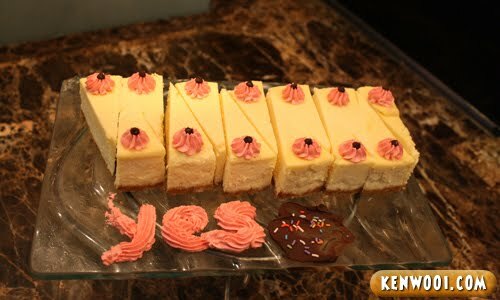 Yes, say “yes” to cheese cakes! I had a few slices, it’s more delicious than Secret Recipe’s cheese cakes. 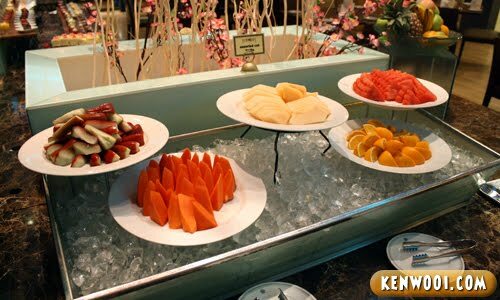 And not forgetting the assorted cut fruits counter! 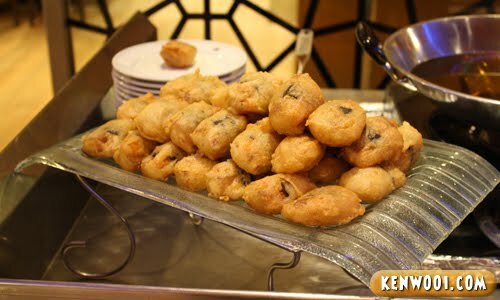 Besides that, Flavors Restaurant has their own version of nin gou, also known as glutinous rice cakes. Mixed with sweet potato, yam and pumpkin, the “modified” nin gou is wrapped with seaweed and coated with flour. Then, it’s deep fried to perfection. Pretty tasty, I gotta say. Love the crunchiness on the outside, and the softness on the inside. So that’s pretty much the choice of food I had during the buffet session. 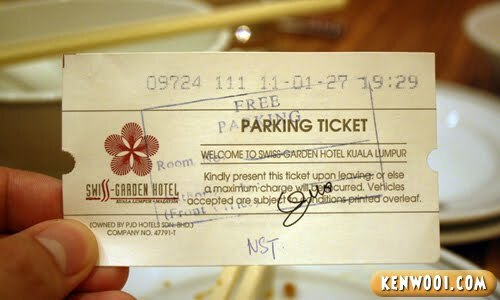 Oh yeah, it was actually an invitation dinner for the “media” people – but instead of giving me the “blogger” title, the Corporate Communications Officer wrote “NST” on my parking ticket. Looks great man! I gotta wait for my CNY buffet after CNY, during my company’s CNY lunch. haha..Happy new year! 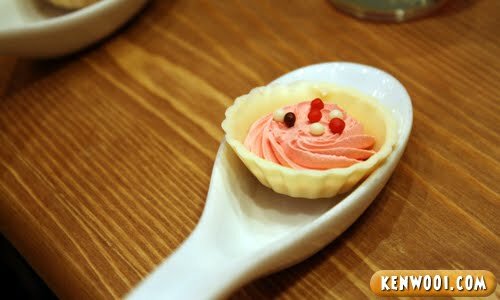 Cheese…tarts..cakes..jello.. OMG.. *DrooLs like mad..
Hope to get a chance going there!! Yippee!! Jalan Petaling? No, thank you…and all hotel food tastes the same…double no, thank you. Have a Wonderful and Happy Chinese New Year bro..
Phwaah! 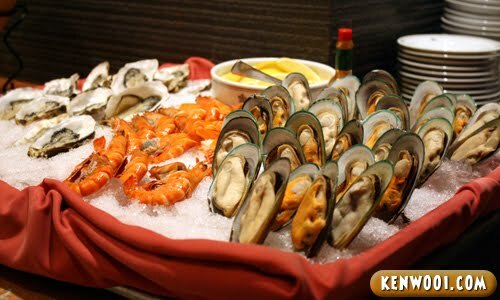 Such lovely food ah… eh, Wei Ken, if like this keep on eating, macam mana mau keep fit? I prefer bugs bunny =p Happy new year!